A selection of some of the best feature articles from the magazine Clumbers. 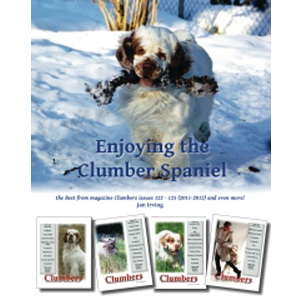 The book covers a diverse range of topics, including artists, grooming, working in the field, breeder reflections on the state of the breed, good breeding selection, history of the Clumber Spaniel, computer records, dogs that collect, how puppies develop, postage stamps to feature the breed, and what it is like to live with Clumbers. An excellent resource for a Clumber lover and still very interesting to other dog folk.